Cover artwork: The Holy Head from a fifteenth-century Book of Hours. The English anonymous fifteenth-century Missa Caput at the centre of this disc is probably the most significant work from the period. It was copied all across Britain and the Continent and was largely responsible for the universal adoption of the 'parody Mass' technique and of today's standard four-part choir arrangement. It is a work of great stature and beauty, in this performance interspersed with a curious Latin poem which describes how two small boys composed the Salve regina antiphon while languishing in Hell. Also represented here are six fifteenth-century carols, and an exquisite Agnus Dei from the Old Hall Manuscript. With the fourth volume in this series we have embarked on a repertoire entirely new to Gothic Voices: the polyphonic Masses of the fifteenth century. Taking the sound and style of a group that has always specialized in songs and adapting it to works of some twenty-five minutes duration has been an exhilarating challenge. We begin with the most famous and influential of all the English Masses, the Missa Caput, basing our performance upon an unpublished edition by Gareth Curtis. This is followed in volume 5 of ‘The Spirits of England and France’ by another English masterpiece, the Missa Veterem hominem. 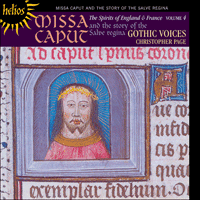 The anonymous English Missa Caput was one of the most revered compositions of the fifteenth century. This much is clear enough from the fact that it has survived in no fewer than seven manuscripts, more than for any other Mass written before the 1480s. But its importance is measurable in far more than just the number of copies that have happened to escape destruction. It was also a piece that had a major impact on other composers of the day. At least two composers—Ockeghem and Obrecht—used it as a model for Masses of their own and its impact went a lot further than this: it was a key work in spawning a whole range of Masses by Continental composers constructed on similar lines and it seems to have been one of the earliest pieces to have added a fourth, low contratenor part in the bass range to the three-voice texture that was standard around the time that it was composed (probably in the 1440s). This four-voice idiom, a forerunner of our standard SATB, spread rapidly through Western Europe, and within about thirty years it had largely taken over as the standard texture for art music. In so many way the ‘Caput’ Mass was a convergence of ideas whose ‘time had come’. It hit Continental Europe at a time when, as at no other time in history, English music was very much in vogue, and at the centre of this vogue was a huge appetite for English Mass cycles. The idea of using shared musical material for settings of successive items in the Mass Ordinary, something which we take for granted today, was still a very young one, and English composers had devised a method of construction in which a single melody was taken from outside the liturgy of the Mass and laid out in the tenor in each movement or section of a movement. Sometimes the melody was set forth in the same succession of long notes for each statement; on other occasions it was presented in more elaborate forms. But the effect was always much the same: to provide a structural framework around which various counterpoints could provide—rather in the manner of glosses on sacred texts or the illuminations and arabesques in Books of Hours—endlessly changing and richly patterned musical adornments. This then is the world into which the Missa Caput was born: a world of remarkable musical fecundity which had at its centre a development which has been characterized as one of the founding moments of Western music. Liturgical circumstances and musical wherewithal converged to produce—for the first time—multi-movement musical structures encompassing up to half-an-hour of music. The possibilities that this new technique offered were quickly grasped: it was so widely and scrupulously imitated in the 1450s and 1460s that it is often virtually impossible to distinguish English Masses from their Continental clones. Such a Mass cycle was usually identified in its manuscript copies by the first word or words originally set to the melody which it had borrowed for its tenor, and it is by such names that these pieces are known today. The melody used in the ‘Caput’ Mass started life as a long tenor melisma on the word ‘caput’ (in Latin, ‘head’) in a chant for a special ritual service of the washing of the feet held on Maundy Thursday in the English Sarum and other liturgical uses. The text comprises a dialogue between Jesus and Peter in which Jesus states: “If I wash thee not, thou hast no part with me”. Peter replies: “Lord, not my feet only, but also my hands and my head”. The melody is heard, in long notes, twice in each movement, the first time in triple metre and the second in duple metre. For those listeners familiar with the standard form of the Kyrie, the ‘Caput’ Kyrie will come as a surprise: following English practice it sets a long troped text, or ‘prosula’, beginning with the words ‘Deus creator omnium’. It was this movement which first alerted scholars to the fact that the Mass could not be by Dufay, as was once thought, but must rather be an English work. The sad effect of this removal of the Mass from the Dufay canon was that performances of it, which had been common, dropped off almost completely. But as this recording demonstrates, it is not difficult to understand why this magnificent work was taken up by a generation of composers as a challenge to their own creative powers. Whoever wrote this beautiful Mass, with its rich, sonorous textures and elegant lines, it is as striking and satisfying a work today as it must have been when, over half a millennium ago, it was one of the most popular works in Western Europe. The composer of the Missa Caput probably envisaged that his work would be sung by four singers, all adult males, or possibly by larger forces in a proto-choral distribution that is especially likely to have favoured extra singers on the top part. In this performance the Mass is performed with one voice to a part, and all four voices have been texted. It was customary for the upper two parts (superius and contratenor) to be texted in English Mass music of this period; as for the lower two parts, including the tenor which uses the ‘Caput’ melisma, ‘it seems entirely plausible that the skilled [medieval] singer would accommodate text as he could, breaking ligatures as necessary … Where he encountered insoluble problems … presumably he could have divided one or two long notes if only a few syllables remained to be sung, or he could have cut the text in a convenient manner, resuming with the next phrase’ (G Curtis, ed., Fifteenth-Century Liturgical Music III: The Brussels Masses, Early English Church Music 34 (London, 1989), pp. xiv–xv). This seems eminently sensible. The Missa Caput is not a set of Renaissance madrigals designed to project a text but a means of adorning a major liturgical feast with an appropriately luxurious clamour while the Ordinary texts are being spoken by the celebrant and other ministers. Texting—or partially texting—the lower parts of the Mass produces a richer palette of vowel colours than when the two lower parts are vocalized, and produces musical lines which are more appetizing for the performers to sing and are easier to phrase. Full texting also provides a useful artistic resource, namely the chance to synchronize vowels for extended melismas in all voices and thus to modify the colour of the music. If a word like ‘mundi’ is to be sung, for example, there is a profound contrast between a four-voice prolongation of the bright second syllable (munDI) and a prolongation of the darker first syllable (MUNdi). It has been suggested that some fifteenth-century Masses—perhaps most of them—were conceived by their composers as large compositional projects in five movements, the intervening plainsong and ceremonial having little place in their artistic conception. This view has its attractions, of course, for it prints a licence for us to do exactly what we find easiest and most convenient: namely to study or perform these Masses without reference to their liturgical context. We have taken the view here that an alternation of monody and polyphony can be a great aid to the modern listener when presented with the five movements of a Mass such as the Missa Caput. Accordingly, we have interspersed the movements of the Mass with verses from a recently discovered Latin song about the origins of the great Marian antiphon, Salve regina. Most of the other items gathered here are carols, three sung and three performed on a trio of medieval lutes. Carols make excellent instrumental music, and contemporary pictures suggest that fifteenth-century listeners were fond of the bright, brittle sonorities of strings plucked with quill plectra. The poetry of carols often expresses a profound but plain religious conviction: note the triumphantly simple view of Becket’s conflict with Henry II in the first verse of Clangat tuba. The musical settings in the carol repertory seem ideal for such poetry, for they are open-hearted, joyful, and wear their learning lightly. In many of these carols we find the root stock of English melodic and contrapuntal art that flowers so remarkably in the Missa Caput; listen especially to the duets in Clangat tuba, for example. The form of the carol, with its alternation of verse and chorus, is undoubtedly derived from the dancing songs which bore exactly the same name (Chaucer, for example, calls them carole). However learned their music, the polyphonic English carols usually retain a certain lightness of tone from their predecessors, hardly any of which were written down. We may imagine the polyphonic carols being performed in a secular or ecclesiastical hall on one of the great feasts of the church year (especially Christmas). The performers would have been drawn from the singing men and from the choristers of some choral foundation. Virtually all of the fifteenth-century English carols are anonymous, but a small number are attributed to a medieval Lennon and McCartney, namely Smert and Trouluffe, both Devonshire men. Richard Smert was Rector of Plymtree, near Exeter, between 1435 and 1477. Finally, the four-voice Agnus Dei from the Old Hall Manuscript. This is the oldest piece on the recording, and admirably illustrates the sheer love of chords which is such an enduring quality of medieval English music and which the Missa Caput displays so generously. Ce volume, le quatrième de la série, a entraîné les Gothic Voices dans un répertoire entièrement nouveau: les messes polyphoniques du XVe siècle. Prendre le son et le style d’un groupe, depuis toujours spécialisé dans les chansons, et les adapter à des œuvres de quelque vingt-cinq minutes constitua un défi exaltant. Nous commençons par la plus célèbre et la plus influente de toutes les messes anglaises, la Missa Caput, en fondant notre interprétation sur une édition non publiée de Gareth Curtis. Elle sera suivie, dans le volume 5 de cette même série, par un autre chef-d’œuvre anglais, la Missa Veterem hominem. La Missa Caput anonyme anglaise fut l’une des compositions les plus vénérées du XVe siècle, comme l’atteste le seul fait qu’elle ait survécu dans pas moins de sept manuscrits, ce qui n’est le cas d’aucune autre messe antérieure aux années 1480. Mais son influence se mesure bien au-delà du simple nombre de copies ayant pu échapper à la destruction, tant cette pièce eut aussi un impact majeur sur d’autres compositeurs de l’époque: deux d’entre eux au moins—Ockeghem et Obrecht—l’utilisèrent comme modèle pour leurs propres messes. Son impact alla même beaucoup plus loin, en ce sens qu’elle représenta une œuvre clé, source de toute une gamme de messes, construites sur des lignes similaires, chez les compositeurs d’Europe continentale. Elle semble, en outre, avoir été une des toute premières pièces à avoir ajouté une quatrième partie grave de contratenor, dans la basse, à la texture à trois voix qui constituait la norme au moment de sa composition, probablement dans les années 1440. Ce style à quatre voix, préfiguration de notre classique SATB, se répandit rapidement à travers toute l’Europe occidentale et s’imposa largement, en une trentaine d’années, comme la texture standard pour la musique savante. La messe «Caput» fut, de bien des manières, une convergence de thèmes dont «l’heure était venue». Elle frappa l’Europe continentale à une époque où la musique anglaise connut une vogue, sans égale dans son histoire, centrée autour d’un appétit énorme pour les cycles de messe anglais. L’idée d’utiliser un matériau musical commun pour des mises en musique de pièces successives dans l’ordinaire de la messe—une chose que nous tenons aujourd’hui pour établie—était encore tout à fait nouvelle, et les compositeurs anglais avaient conçu une méthode de construction, dans laquelle une seule mélodie était prise en dehors de la liturgie de la messe et présentée, dans le tenor, dans chaque mouvement ou section de mouvement. La mélodie était parfois exposée dans la même succession de longues pour chaque énonciation, tandis que d’autres occasions la proposaient dans des formes plus élaborées. Mais l’effet était toujours le même: fournir une trame structurelle autour de laquelle divers contrepoints pouvaient offrir des ornements musicaux sans cesse changeants, aux motifs riches—un peu à la manière des gloses sur les textes sacrés ou des arabesques et des enluminures dans les livres d’heures. Tel est donc le monde qui vit naître la Missa Caput: un monde d’une remarquable fécondité musicale avec, en son cœur, un développement considéré comme l’un des instants fondateurs de la musique occidentale. Les événements liturgiques et les moyens musicaux convergèrent pour produire— pour la première fois—des structures musicales à plusieurs mouvements susceptibles de durer jusqu’à une demi-heure. Cette technique nouvelle, dont les possibilités furent rapidement saisies, se répandit comme une traînée de poudre; elle fut si largement et si religieusement imitée dans les années 1450 et 1460 qu’il est presque impossible de distinguer les messes anglaises de leurs clones d’Outre-Manche. Ces cycles de messe étaient généralement identifiés dans leurs copies manuscrites par le ou les mots qui commençaient originellement la mélodie empruntée pour leur tenor, et c’est sous de tels noms que ces pièces sont connues aujourd’hui. La mélodie utilisée dans la messe «Caput» fut d’abord un long mélisme de tenor sur le mot «Caput» (lat. «tête»), dans un chant destiné à un service rituel spécial pour le lavement des pieds, lors du jeudi saint, dans le Sarum Use anglais comme dans d’autres rites liturgiques. Le texte comprend un dialogue entre Jésus et Pierre, où Jésus déclare: «Si je ne te lave, tu n’as point de part avec moi.» Et Pierre de répliquer: «Seigneur, non seulement mes pieds, mais aussi mes mains et ma tête.» La mélodie est entendue, en longues, deux fois par mouvement, la première fois dans une mesure ternaire, la seconde dans une mesure binaire. Pour les auditeurs familiers avec la forme standard du Kyrie, le Kyrie de la «Caput» apparaîtra comme une surprise, car il met en musique, conformément à l’usage anglais, un long texte tropé, ou «prosula», qui débute par les mots «Deus creator omnium». En réalité, ce fut ce mouvement qui, le premier, alerta les érudits du fait que cette messe n’était pas de Dufay, comme on le pensait naguère, mais plutôt d’un compositeur anglais. Cette suppression du canon de Dufay eut cependant un effet malheureux sur l’œuvre, dont les interprétations, qui avaient été courantes, s’endormirent presque totalement. Mais, cet enregistrement l’atteste, il n’est pas difficile de comprendre pourquoi toute une génération de compositeurs considéra cette pièce magnifique comme un défi à ses propres pouvoirs créateurs. Quel qu’en soit l’auteur, cette messe splendide, aux textures sonores riches et aux lignes élégantes, demeure aussi frappante et satisfaisante qu’elle dut l’être voilà un demi-millénaire, lorsqu’elle était l’une des œuvres les plus populaires d’Europe occidentale. Le compositeur de la Missa Caput envisageait probablement que son œuvre fût chantée par quatre interprètes masculins adultes, ou peut-être par des forces plus grandes, dans une distribution protochorale qui aurait particulièrement favorisé des chanteurs supplémentaires dans la partie supérieure. La messe est interprétée ici avec une voix par partie, les quatre voix ayant été dotées d’un texte. Dans la musique anglaise de cette époque, il était coutumier de pourvoir de textes les deux parties supérieures (superius et contratenor); quant aux deux parties inférieures, dont le tenor qui utilise le mélisme «Caput», «il semble tout à fait plausible que le chanteur [médiéval] expérimenté s’accommodait du texte comme il le pouvait, scindant les ligatures en cas de nécessité … Lorsqu’il rencontrait des problèmes insolubles … il pouvait vraisemblablement avoir soit divisé une ou deux longues s’il ne restait que quelques syllabes à chanter, soit coupé le texte d’une manière pratique, reprenant avec la phrase suivante» (G Curtis, éd., Fifteenth-Century Liturgical Music III: The Brussels Masses, Early English Church Music 34 (Londres, 1989), pp. xiv–xv). Ce qui semble éminemment judicieux. La Missa Caput n’est pas un corpus de madrigaux de la Renaissance conçu pour présenter un texte mais un moyen d’orner une fête liturgique majeure, avec une acclamation adéquatement somptueuse, pendant que les textes de l’ordinaire sont énoncés par le célébrant et les autres ministres. Fournir un texte complet—ou partiel—aux parties inférieures de la messe produit à la fois une palette de couleurs vocaliques plus riche que lorsque les deux parties inférieures sont vocalisées, et des lignes musicales plus agréables à chanter, plus faciles à prononcer, pour les interprètes. La fourniture d’un texte complet procure également une ressource artistique utile, savoir la possibilité de synchroniser les voyelles pour effectuer des mélismes prolongés dans toutes les voix, et donc modifier la couleur de la musique. Si un mot comme «mundi» doit, par exemple, être chanté, il existe un profond contraste entre une prolongation à quatre voix de la seconde syllabe, claire (munDI), et une prolongation de la première syllabe, plus sombre (MUNdi). L’on a suggéré que certaines messes du XVe siècle—peut-être la majorité d’entre elles—furent imaginées par leurs auteurs comme de grandes compositions en cinq mouvements, l’intervention du plain-chant et le cérémonial occupant peu de place dans leur conception artistique. Ce point de vue est bien sûr tentant car il nous donne licence de faire exactement ce que nous trouvons le plus facile et le plus pratique: étudier ou interpréter ces messes sans référence à leur contexte liturgique. Nous avons pensé qu’une alternance de monodie et de polyphonie pourrait être d’un grand secours pour l’auditeur moderne des cinq mouvements d’une messe comme la Missa Caput. Aussi avons-nous émaillé les mouvements de la messe de versets d’un chant latin, récemment découvert, sur les origines de la grande antienne mariale Salve regina. La plupart des autres pièces de cet enregistrement sont des carols, dont trois sont chantés et trois sont exécutés sur un trio de luths médiévaux. Les carols constituent une excellente musique instrumentale et les images d’époque suggèrent que les auditeurs du XVe siècle appréciaient particulièrement les sonorités brillantes, aiguës, des cordes pincées à l’aide d’un plectre en plume d’oie. La poésie des carols traduit souvent une conviction religieuse profonde mais sans détours, à l’instar de la simplicité triomphante du conflit qui oppose Becket à Henry II dans la première strophe du Clangat tuba. Les styles musicaux du répertoire des carols semblent idéaux pour une telle poésie tant ils sont francs, joyeux, et affichent leur savoir avec légèreté. Dans nombre de ces carols, nous trouvons la souche de l’art mélodique et contrapuntique anglais qui fleurit si remarquablement dans la Missa Caput; écoutez notamment les duos dans Clangat tuba. La forme du carol, avec son alternance strophe-refrain, est indubitablement dérivée des chansons à danser qui portaient exactement le même nom (Chaucer, par exemple, les appelle carole). Quelque savante que soit leur musique, les carols polyphoniques anglais gardent généralement une certaine légèreté de ton par rapport aux œuvres antérieures, qui ne connurent presque jamais de forme écrite. Nous pouvons imaginer l’exécution des carols polyphoniques dans une salle séculière ou ecclésiastique, lors d’une des grandes fêtes de l’année liturgique (particulièrement Noël). Les interprètes auraient alors été choisis parmi les chanteurs adultes et les choristes de quelque institution chorale. Pratiquement tous les carols anglais du XVe siècle sont anonymes, mais un petit nombre d’entre eux sont attribués aux Lennon et McCartney médiévaux que furent Smert et Trouluffe, tous deux associés au Devonshire. De 1435 à 1477, Richard Smert fut recteur de Plymtree, près d’Exeter. Enfin, l’Agnus Dei à quatre voix, extrait de l’Old Hall Manuscript, constitue la plus ancienne pièce de cet enregistrement; il illustre admirablement l’amour infini des accords, cette qualité si durable de la musique médiévale anglaise, dont la Missa Caput fait si généreusement montre. Mit dem vierten Band dieser Serie begeben wir uns in ein für die Gothic Voices vollkommen neues Repertoire: Polyphone Messen aus dem fünfzehnten Jahrhundert. Betrachtet man Klang und Stil eines seit jeher auf Lieder spezialisierten Ensembles und paßt diese Werken von über fünfundzwanzigminütiger Dauer an, offenbart sich die berauschende Herausforderung dieser Musik. Wir beginnen mit der berühmtesten und einflußreichsten aller englischen Messen, der Missa Caput. Unsere Aufnahme basiert auf einer unveröffentlichten Ausgabe von Gareth Curtis, wonach dann in Band 5 der „Geister Englands und Frankreichs“ ein weiteres englisches Meisterwerk zu hören ist, die Missa Veterem hominem. Die anonyme, englische Missa Caput gehörte im fünfzehnten Jahrhundert zu jenen Kompositionen, denen höchste Verehrung zuteil wurde. Dies läßt sich zweifellos daraus schließen, daß sie uns in ganzen sieben Manuskripten erhalten geblieben ist, also sehr viel zahlreicher als jede andere Messe, die ihren Ursprung in der Zeit vor 1480 hat. Ihre Bedeutung läßt sich jedoch an weitaus mehr messen, als nur an jener Zahl von Kopien, die einer Zerstörung entgangen sind. Es war nämlich außerdem ein Werk, das einen enormen Einfluß auf andere Komponisten der damaligen Zeit hatte: Mindestens zwei Komponisten—Ockeghem und Obrecht—diente sie als Vorlage für eigene Messen. Ihre Reichweite erstreckte sich jedoch noch weiter: Sie war ein richtungsweisendes Schlüsselwerk, indem sie andere europäische Komponisten zu einer Reihe von Messen ähnlichen Stils inspirierte. Die Messe scheint zudem eines der frühesten Werke zu sein, denn zur damals üblichen dreistimmigen Struktur hatte sich nun noch eine vierte, tiefe Contratenorstimme gesellt, weshalb die Entstehung der Messe in den 1440er Jahren anzusetzen ist. Dieses vierstimmige Idiom, Vorläufer unseres heutigen SATB-Standards, fand schnell im gesamten westlichen Teil Europas Verbreitung, und im Laufe von ungefähr dreißig Jahren hatte es sich in der Musikkunst als Standardstruktur fest verankert. In vieler Hinsicht war die „Caput“-Messe eine Konvergenz von Ideen, deren „Zeit gekommen war“. Sie erreichte das europäische Festland in einer Zeit, zu der, einmalig in der Geschichte, englische Musik sich äußerster Beliebtheit erfreute. Ein enormer Appetit auf englische Messezyklen stand hierbei im Mittelpunkt. Das Konzept, Vertonungen aufeinander folgender Teile des Ordinarium missae auf ein gemeinsames musikalisches Material zu basieren, eine Technik, die heute eine Selbstverständlichkeit ist, steckte damals noch in den ersten Anfängen. Englische Komponisten hatten eine Methode entwickelt, derzufolge in jedem Satz oder Satzabschnitt die Tenorstimme eine Melodie darbot, die nicht aus der Messeliturgie stammte. Manchmal wurde diese Melodie bei jedem Themeneintritt von derselben Folge langer Noten eingeleitet, zuweilen aber auch in kunstvollerer Form präsentiert. Die Wirkung war indessen weitgehend dieselbe; nämlich einen strukturellen Rahmen für die zahlreichen Kontrapunkte zu schaffen—so recht in der Manier von Glossen heiliger Texte oder Darstellungen und Arabesques der Stundenbücher—in unendlichen Wechseln und reichen, musikalischen Verzierungen. Diese war die Welt, in die die Missa Caput geboren wurde: Eine Welt bemerkenswerter musikalischer Fruchtbarkeit, aus deren Herzen sich eine Tendenz herausentwickelte, die später als Grundstein westlicher Musik bezeichnet werden sollte. Liturgische Umstände und musikalisches Werkzeug brachten vereint erstmals mehrsätzige Strukturen von Musik hervor, die eine Dauer von bis zu dreißig Minuten hatte. Die Möglichkeiten, die diese neue Technik bot, wurden schnell allerorts erforscht: Wie ein Lauffeuer fand sie Verbreitung und wurde in den 1450ern und 1460ern so umfassend und gewissenhaft imitiert, daß es heute praktisch unmöglich ist, englische Messen von ihren auf dem europäischen Festland entstandenen Klonen zu unterscheiden. Ein solcher Messezyklus wurde in den handschriftlichen Kopien gewöhnlich durch das erste vertonte Wort oder die ersten vertonten Wörter jener Melodie identifiziert, die für die Tenorstimme entlehnt worden war. Unter diesen Worten sind die Werke noch heute bekannt. Die in die „Caput“-Messe eingeflochtene Melodie setzt erstmals in Gestalt einer langen Melasmatik der Tenorstimme bei den Worten „Caput“ (im Lateinischen „Haupt“) ein, mit einem Gesang, der sowohl für eine ganz besondere Sarum-Zeremonie zum Waschen der Füße am Gründonnerstag als auch für andere Liturgien bestimmt war. Der Text beschreibt einen Dialog zwischen Jesus und Peter, in dem Jesus die Behauptung äußert: „Wenn ich sie Dich nicht wasche, mußt Du allein weiterziehen“, worauf Peter antwortet: „Herr, nicht nur meine Füße, sondern auch Hände und Haupt“. Die Melodie erklingt in langen Noten jeweils zweimal in jedem Satz, zuerst im Tripel-, dann im Zweiertakt. Für jene Hörer, die die Standardform des Kyrie, das „Caput“-Kyrie, kennen, wird folgendes eine Überraschung sein: Nach englischem Brauch stellt das Kyrie die Vertonung eines langen Tropentextes, oder „Prosula“, dar und beginnt mit den Worten „Deus creator omnium“. Tatsächlich war es dieser Satz, der die Musikwissenschaftler erstmals darauf aufmerksam machte, daß die Messe nicht, wie bisher angenommen, ein Werk Dufays war, sondern vielmehr aus englischer Feder stammen könnte. Als eine traurige Folge des Streichens der Messe aus Dufays Kanon finden deren sonst so häufigen Aufführungen nun kaum noch statt. Diese Aufnahme offenbart zweifellos die Gründe dafür, warum eine Generation von Komponisten dieses hervorragende Werk als Herausforderung an ihre eigene Vorstellungskraft wieder aufgegriffen hat. Wer auch immer der damalige Urheber dieser wunderschönen Messe mit ihren reichen, wohlklingenden Strukturen und eleganten Zeilen war—sie hat bis heute nichts an jener bezaubernden und angenehmen Ausstrahlung eingebüßt, die sie vor einem halben Jahrtausend zu einem der beliebtesten Werke Westeuropas gemacht hatte. Der Komponist der Missa Caput sah vermutlich voraus, daß sein Werk von vier Sängern vorgetragen werden würde, von Männern oder einer größeren Gesangskraft, möglicherweise in einer Art ur-choraler Besetzung, für deren hohe Stimme mit großer Wahrscheinlichkeit zusätzliche Sänger bevorzugt werden würden. Auf dieser Aufnahme bietet jeweils ein Sänger seine Singstimme der Messe dar, deren vier Singstimmen allesamt getextet sind. In der damaligen Zeit war es in der englischen Messemusik nicht unüblich, die beiden Oberstimmen (Superius und Contratenor) mit Text zu versehen. Im Hinblick auf die beiden unteren Stimmen, also auch auf den das „Caput“-Melisma singenden Tenor, „scheint es plausibel, daß der geschickte [mittelalterliche] Sänger ganz nach Bedarf Text einbauen und hierbei zwangsläufig auch Ligaturen brechen würde … Dort, wo er unlösbaren Problemen gegenüberstand … hat er, wenn nur noch einige wenige Silben zu singen waren, vermutlich eine oder zwei lange Noten teilen können, oder er mag den Text auf passende Art und Weise eingeteilt und mit der nächsten Phrase fortgesetzt haben“ (G Curtis, ed., Fifteenth-Century Liturgical Music III: The Brussels Masses, Early English Church Music 34 (London, 1989), pp. xiv–xv). Dies erscheint ausgesprochen vernünftig. Die Missa Caput ist keineswegs eine Aneinanderreihung erneut ins Leben gerufener Madrigale, komponiert in der alleinigen Absicht, einen Text zur Geltung zu bringen. Vielmehr ist sie ein verzierendes Mittel, das einer wichtigen Liturgiefeier ihren angemessen-luxuriösen Klang verleiht, während die Ordinarium-Texte vom Zelebranten oder anderen Geistlichen vorgetragen werden. Im Gegensatz zum Vokalisieren entsteht durch das Texten—oder teilweise Texten—der unteren Stimmen der Messe eine reichhaltigere Palette an Vokal-Klangfarben, und es werden Zeilen von Musik geschaffen, die einen Sänger im höheren Maße ansprechen und zudem leichter zu phrasieren sind. Vollständiges Texten liefert außerdem eine nützliche künstlerische Quelle, nämlich die Möglichkeit, Vokale erweiterter Melismen in allen Stimmen zu synchronisieren und somit die musikalische Klangfarbe zu ändern. Wird beispielsweise ein Wort wie „mundi“ gesungen, so gibt es einen profunden Kontrast zwischen einer vierstimmigen Verlängerung der hellen zweiten Silbe (munDI) und einer Verlängerung der dunkleren ersten Silbe (MUNdi). Es wurde bereits die Annahme geäußert, daß viele Messen aus dem fünfzehnten Jahrhundert—vielleicht der Löwenanteil unter ihnen—als große Kompositionsprojekte in fünf Sätzen geschaffen wurden, wobei die künstlerischen Konzepte der Komponisten nur wenig Raum für eingeschobenen Gesang und Zeremoniell ließen. Diese Ansicht hat ihren gewissen Reiz, denn sie erlaubt es uns, eben das zu tun, was uns am einfachsten und praktischsten erscheint: Nämlich diese Messen ohne Bezugnahme auf den jeweils liturgischen Zusammenhang zu studieren oder aufzuführen. Wir haben hier die Ansicht vertreten, daß ein Wechsel von Monodie und Polyphonie dem modernen Hörer eine große Hilfe sein kann, wenn diesem die fünf Sätze einer Messe wie der Missa Caput präsentiert werden. Dementsprechend haben wir die Messesätze mit Strophen erst kürzlich entdeckter, lateinischer Lieder über den Ursprung der großartigen Marienantiphon Salve regina durchsetzt. Der Großteil der anderen, hier zusammengetragenen Stücke besteht ausnahmslos aus Liedern, von denen drei in Gesang, drei von einem mittelalterlichen Lautentrio vorgetragen werden. Lieder sind exzellente Instrumentalmusik, und das heutige Bild der damaligen Hörer beschreibt diese als Liebhaber leichter, zerbrechlicher Wohlklänge der mit einem Federkiel gezupften Streicher. Die poetischen Liedertexte gaben oft eine wohl profunde, dennoch einfache, religiöse Überzeugung wieder: Beachten Sie in der ersten Strophe von Clangat tuba die triumphierend simple Haltung zu Beckets Konflikt mit Henry II. Die musikalischen Vertonungen des Liederrepertoires scheinen für derartige Poesie geradezu ideal zu sein, mit ihrer Offenherzigkeit, ihrer Heiterkeit und ihrer schwerelosen Gelehrsamkeit. In vielen dieser Lieder offenbart sich uns die Wurzel der englischen Melodie- und Kontrapunktkunst, die in der Missa Caput so bemerkenswert erblüht. Weiter verdienen unter anderem auch die Duette im Clangat tuba aufmerksames Gehör. Die zwischen Strophe und Refrain alternierende Liederform hat ihren Ursprung zweifellos in den Tanzliedern mit gleichnamigen Titeln (Chaucer nannte sie zum Beispiel carole). Doch von welch akademischem Niveau die Musik auch sein mag, die polyphonen, englischen Lieder strahlen in ihrer Klangwelt im allgemeinen die besondere Leichtheit und Milde aus, für die ihre Vorläufer so verehrt, jedoch nur selten schriftlich festgehalten wurden. Wir können heute nur noch erahnen, wie polyphone Lieder damals zu einer der großen Feiern des Kirchenjahres (im besonderen zu Weihnachten) in einer säkularen oder kirchlichen Halle aufgeführt wurden, von Interpreten, die unter Männern mit gutem Stimmvermögen und Sängern so manch eines Chores ausgewählt wurden. Der Ursprung der meisten der englischen Lieder des fünfzehnten Jahrhunderts ist unbekannt. Eine kleine Anzahl von ihnen ist jedoch einem mittelalterlichen Pendant zu Lennon und McCartney zu verdanken, nämlich Smert und Trouluffe, die beide aus dem Raum Devonshire stammen. Richard Smert war zwischen 1435 und 1477 Pfarrer in Plymtree in der Nähe von Exeter. Abschließend soll hier noch besonders auf das Agnus Dei aus dem Old Hall-Manuskript aufmerksam gemacht werden. Dies ist das älteste Werk der vorliegenden Aufnahme und die bewundernswerte Verkörperung einer schieren Liebe zum Akkord, ein Stilmittel, das die Welt der englischen, mittelalterlichen Musik mit jener so beständigen Klangfarbe malte, die sich in der Missa Caput so großzügig entfaltet.